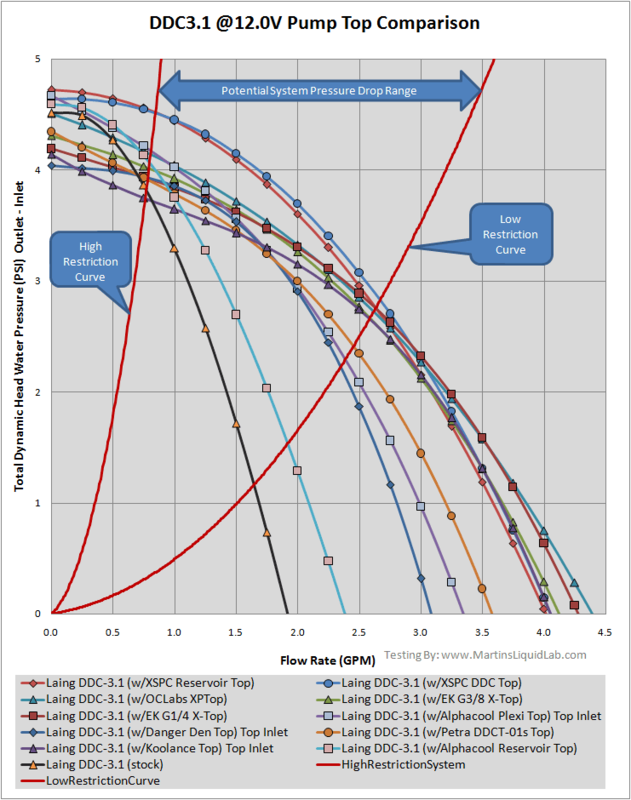 Laing DDC 3.1 (MCP 350) Pump Top Test Comparison - 11 Tops Tested! Linus from NCIX.com provided me with a sample Apogee Drive unit to review. I used the motor from this apogee drive unit (which is a Laing DDC 3.1=MCP350) to complete all of the pump testing below. NCIX is a great place to shop not only for water cooling, but for ALL of your computer needs. They have both the NCIX.com which serves Canada, as well as NCIXUS.com for the united states folks. I highly recommend you visiting their shops on your next computer build, thanks Linus!! Coolmiester (XS member name) of Coolercases UK - Please visit their website and forums. They provide a great resource to the community and wide range of products. Coolmiester sent me the following loaner samples: Petra's DDCT-01s Top, EK-DDC X-Top G1/4, EK-DDC X-Top G3/8, Alphacool DDC plexitop, and the Alphacool DDC Plexi Reservoir. Five of the testing tops, thanks a bunch, very much appreciated! 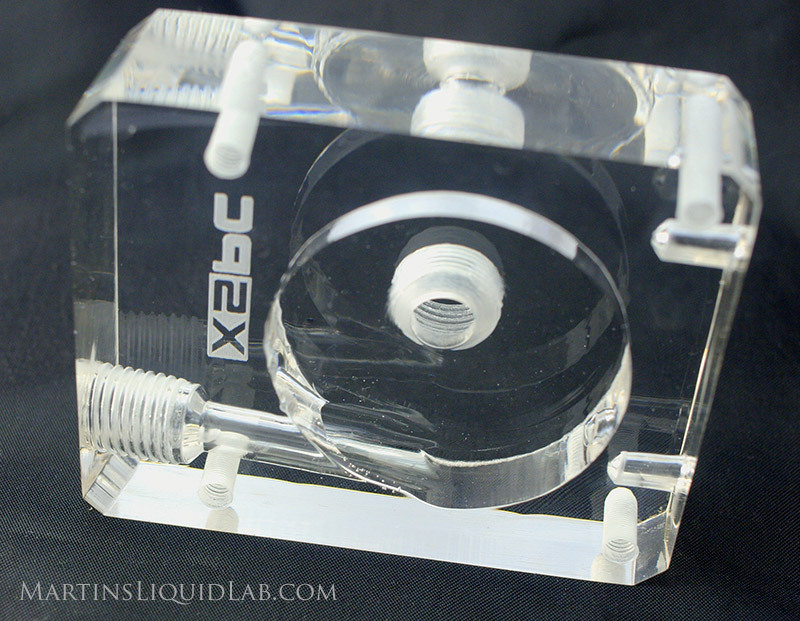 Paul from XSPC provided me with both the XSPC Laing DDC top and their newly release XSPC Acrylic Reservoir DDC Top product samples. A UK based company with some very refined performance products. 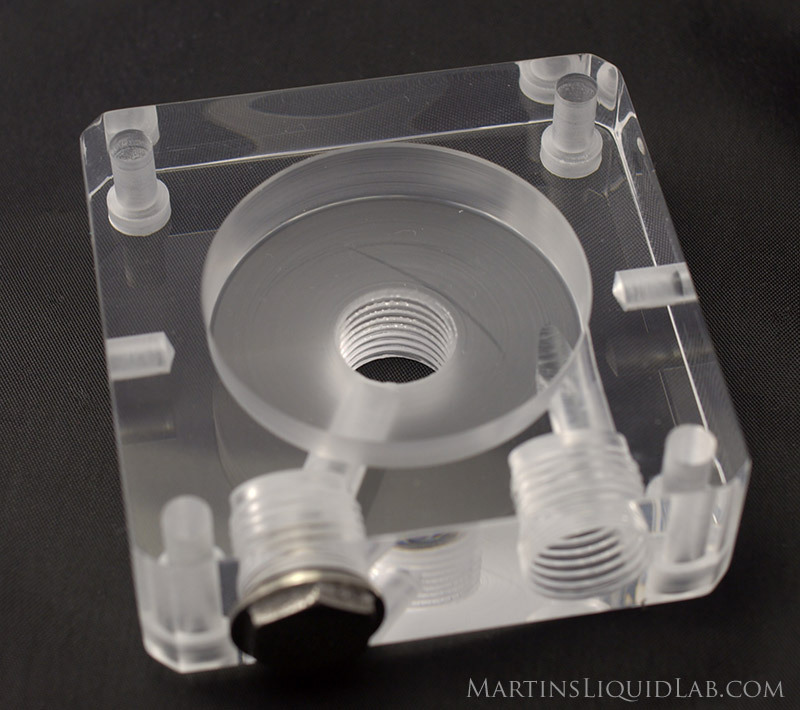 Jeremy from Danger Den provided me with a sample their Danger Den DDC acrylic top. Danger Den is another great manufacturer and reseller of all type of water cooling products, based here in my home state of Oregon in the USA. As you'll see in many of my other reviews they are very committed to producing products with good flow rate capabilities. I've really enjoyed reviewing many of Danger Den's products, they are great folks that manufacture great products!! Gary from Sidewinder Computer Systems provided me with an OClabs sample. I shop at Sidewinder very regularly and highly recommend you check them out. Sidewinder is also committed to providing various forum members gear to test, and very committed to supporting forum members in their testing adventures. They carry a wide range of water cooling gear at the very best prices! Rob from the Watercoolingshop.com provided me with the EKG3/8" Barbs for the EKG3/8" X-Top. He also provided these nice G3/8" to G1/4" adapters which I used in some recent radiator testing. 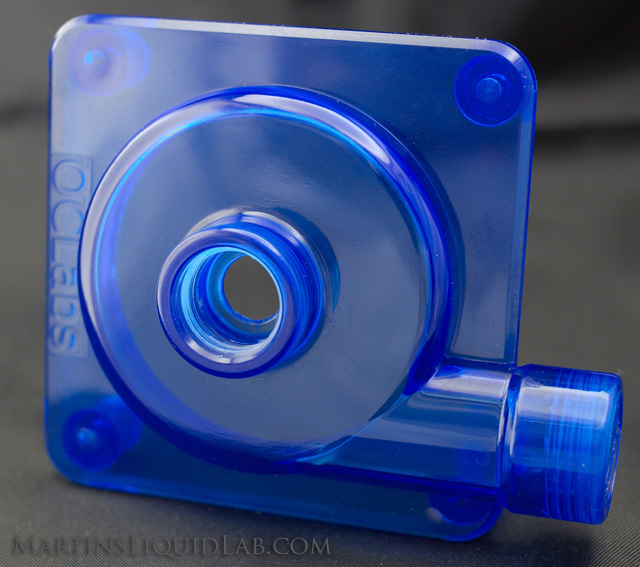 They have a wide variety of water cooling gear and specialize in water cooling parts. I highly recommend them! Nikos from OClabs also provided me with a newer black OClabs XPTop sample. This round of DDC 3.1 testing included this newer version of the top. Check out their site for some fantastic "How it's Made" photos of the XPtop and many of their other products here, great information and I thank Nikos for providing me with an updated top sample to test. Thanks Nikos!! NaeKuh (XS member) Another very active member in the water cooling comminuty always out to try new things. I've been building him a TEC chiller and while I was at it he sent me his EK X-Res 140. Unfortunately I sent this sample back to him before I retested all the samples measuring total head, so I do not have that result. Thanks....you all made this possible!! The pump I used in all of this testing is one that I recentely recieved from Linus at NCIX in the form of an Apogee drive I'll be reviewing. After taking the drive apart for inspection and comparing the motor to a DDC 3.2, it was obvious to me it was a standard Laing DDC 3.1. This is what I needed to complete this round of testing, so I did. 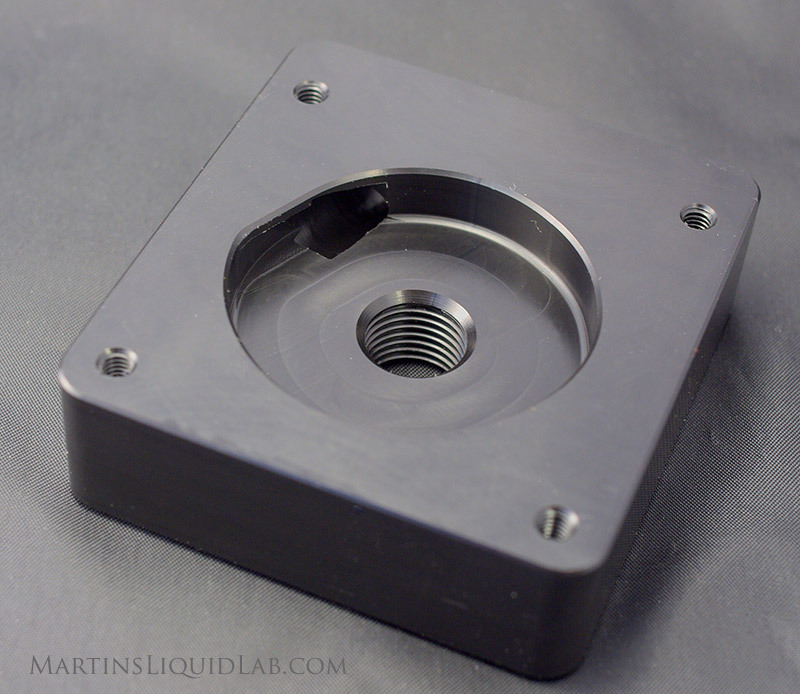 I used the stock top from my DDC3.2 for the stock top testing. To further confirm this, I took my test results for the stock pump and overlaid that on top of swiftech's published results from their site here. I've always had very similar results to swiftech's own testing, so if my results were far off, I would suspect my pump or my testing equipment was off. This is what I got, very similar results....that's good, we have a genuine DDC 3.1 here. I always admire and appreciate the detailed scientific data Swiftech publishes on their products, I can only wish we would see more of this...kudos to Swiftech!! The following table includes individual detailed reports for each top tested. DD Std Outlet Center Inlet. Rect. 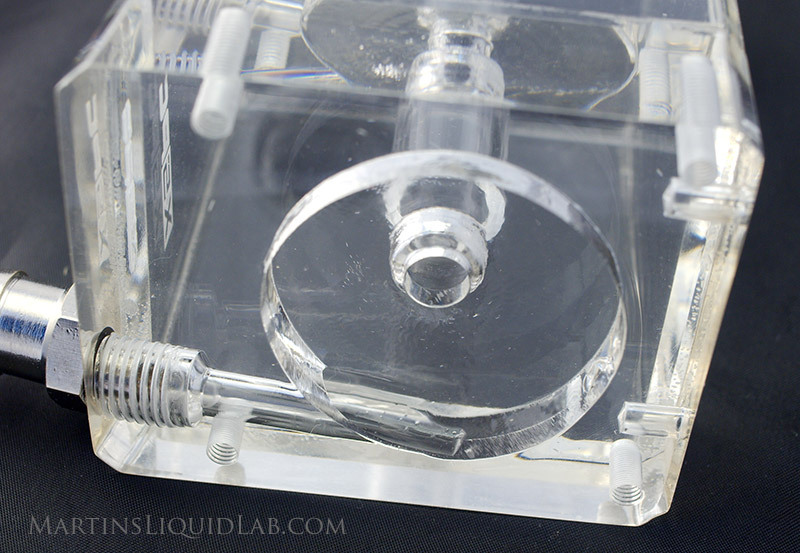 Circle 7.9 N/A D-Tek Injection Molded Acrylic. Coarse Threaded screws. Spiral 7.8 N/A Stock 3/8" barbs It's stock..
First up is the entire curve, and the area to note is in between the two red system curves. The left most limit would be an extremely high restrictive system and to the right would be an extremely low restrictive system. 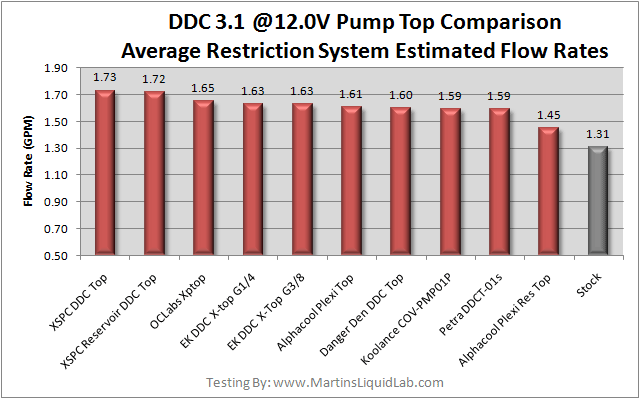 The results are very similar to my DDC 3.2 testing, they all perform much much better than stock particularly on low restriction systems. This is really an extremely restrictive setup, and unfortunately non of the tops bring the system above 1.0GPM, but that's not to say it wouldn't cool adequately, it just wouldn't perform as well as a DDC 3.2. Something this restrictive may even show worthwhile gains from two pumps in series. The Koolance top with the larger openings actually looses a very small performance level over the stock top here. 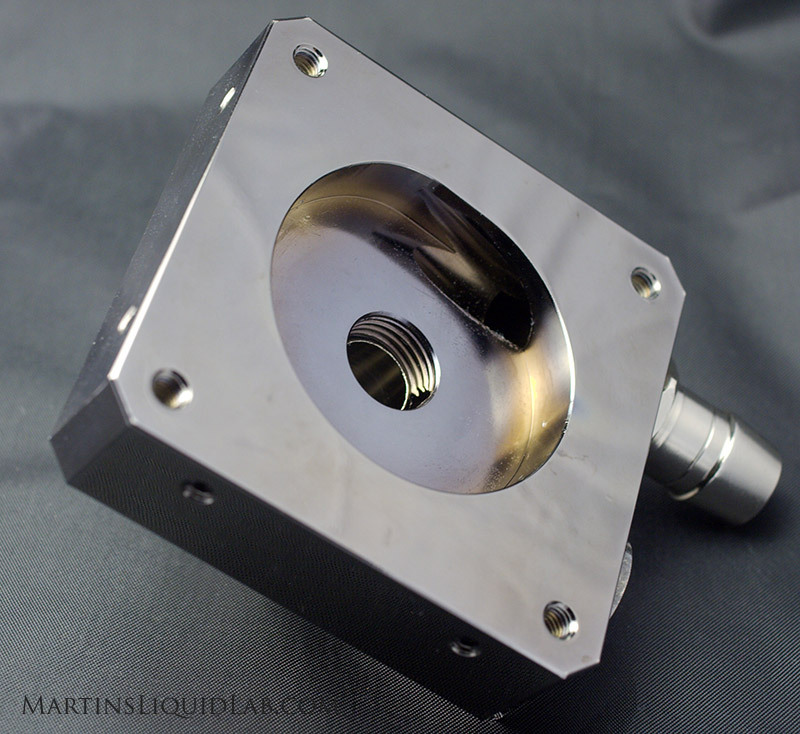 The XSPC reservoir top produces 0.08 GPM over the stock top (an 11% improvement in flow rate). This is what I chose for a medium restriction loop and we're starting to see some notable gains over the stock top here. All of the tops provided gains over the stock top where removing that sharp 90 bend on the inlet starts making a difference. Still a small gain in terms of temperature improvements, but hey it's a notable efficiency gain. 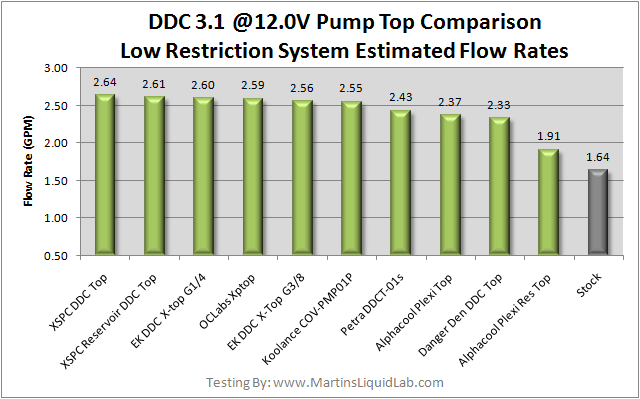 The XSPC DDC produced an overall gain of 0.42GPM over stock (a 32% improvement in flow rate). This is an extremely low restriction CPU only loop, and this is where the tops really start showing their efficiency improvements. 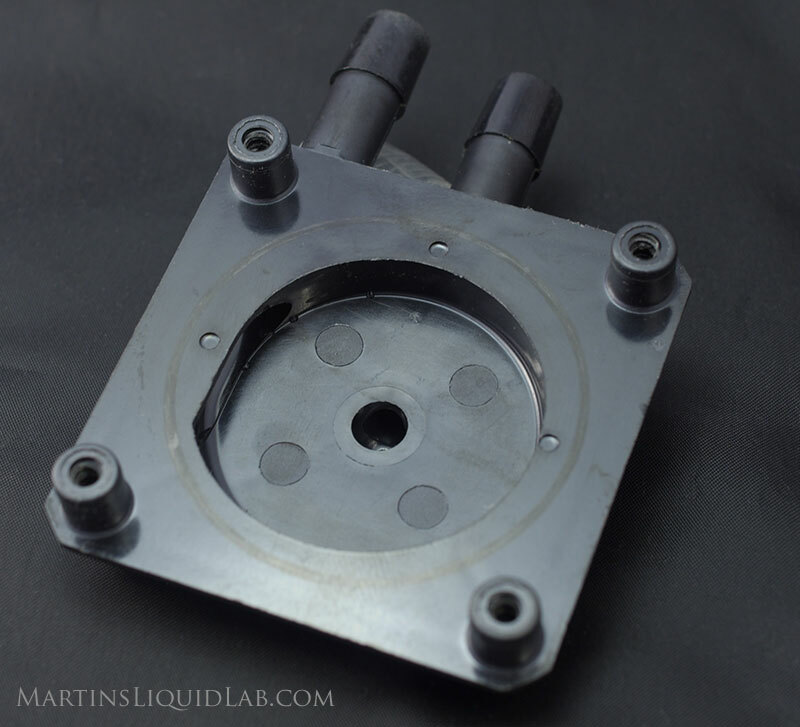 The Alphacool reservoir top is the only one trailing behind and it is due to the side inlet style feed which is very similar to the stock top(Sharp 90 degree bend). All of the other tops provided nearly a full 1 GPM higher flow rates than the stock top, very impressive!! 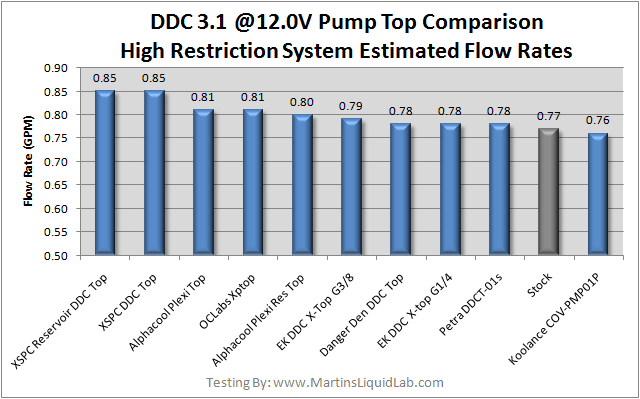 The XSPC DDC top had a very very small lead producing exactly 1.00 GPM over the stock top (A 61% improvement in flow rate!). 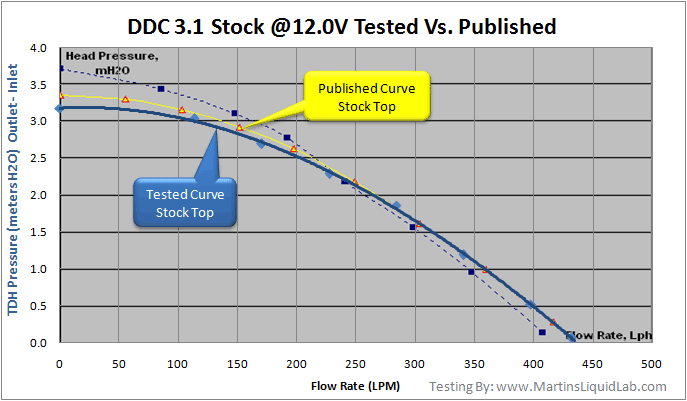 I did experiment with side inlet performance on my initial DDC 3.2 testing and found that performance suffered significantly to the point where the stock top performs better in many cases. 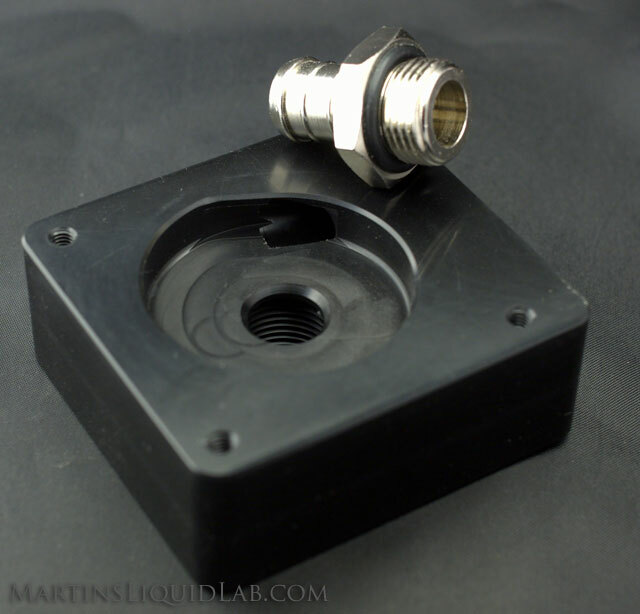 I would not recommend using anything other than the center/top inlet and side outlet for performance gains, anything other than these optimal locations will dramatically reduce performance. Using the side inlets basically gives you stock top performance with the convenience of G1/4 fitting barbs and the aesthetic improvements of the top selected. Part of why I go to the extent of producing the entire curve is also so I can update my flow rate estimator, this allows you to plug in your own parts and see an estimate more tailored to your own system. 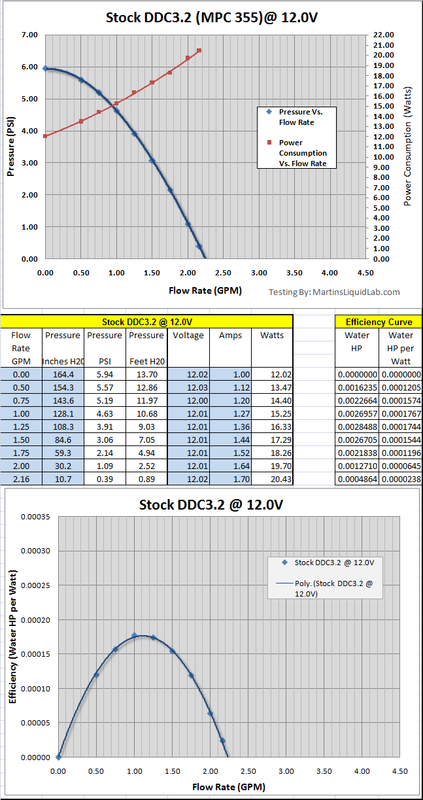 I've updated the flow rate estimator for this series of testing, and you can grab a copy of that excel file here. 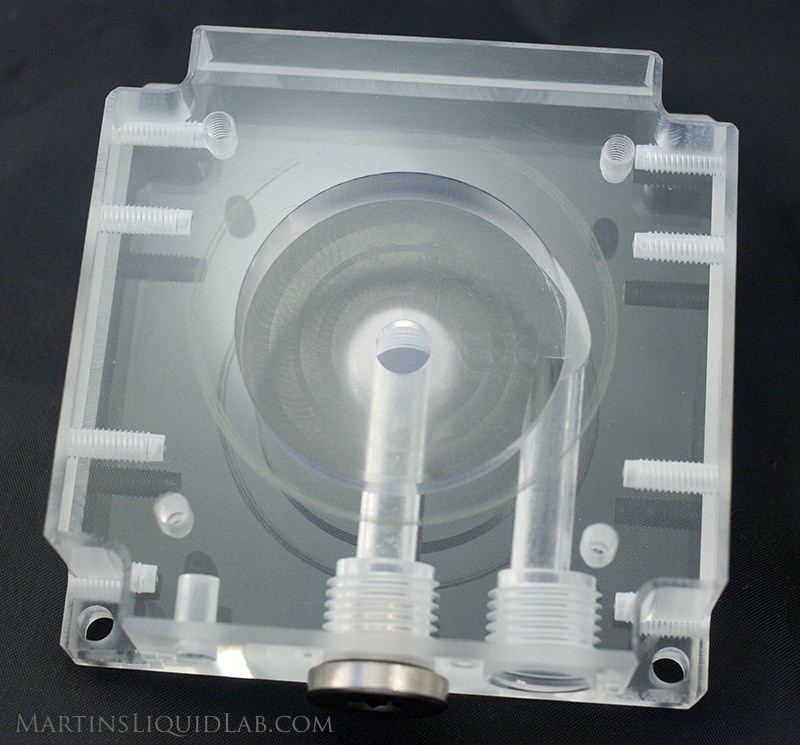 I think it's pretty amazing that these pump tops can gain so much efficiency over the stock pump top, but they are. Kudos for doing a great job there!! I should probably also mention that with low restriction loops the tops will be running the pump motor harder than stock. I know it seems backwards, but the highest power consumption and highest heat generated actually occurs when the system has the least amount of restriction. With that said I know these tops are extremely popular and have been in use for several years now. 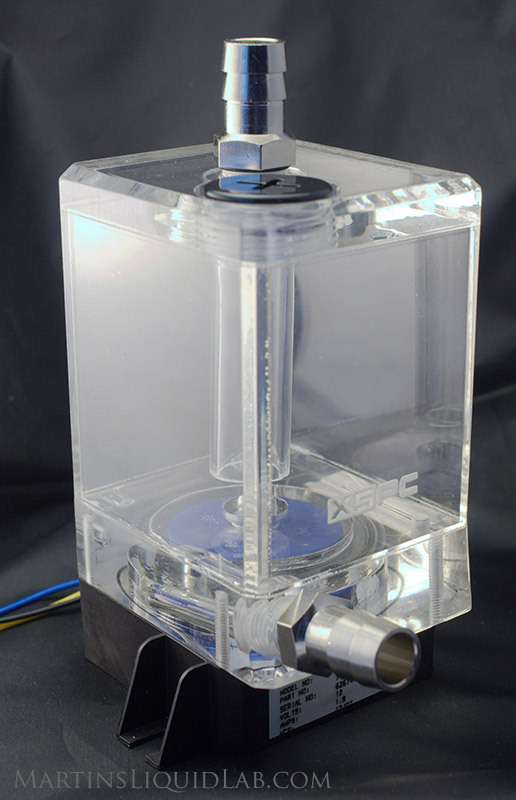 In the end the tops likely won't amount to more than 1 degree of improvement regarding temperature over stock, but who wants to run a stock pump with cheap inefficient and small plastic 3/8" barbs...not me!! These tops offer you the ability to use your choice of quality G1/4 barbs, they provide a variety of material choices between black acetal/delrin to clear acrylic, and they all provide a performance benefit no matter how small. 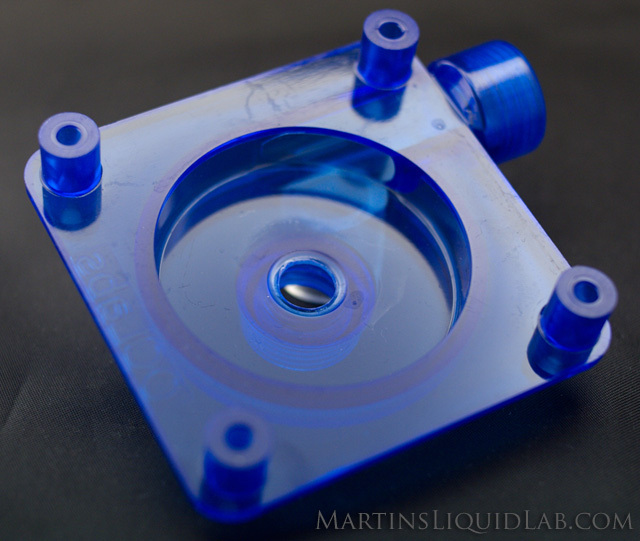 I've found that water cooling improvements generally are small individually (There are no magic bullets), but the sum of many small improvements adds up...here is one more for your system. 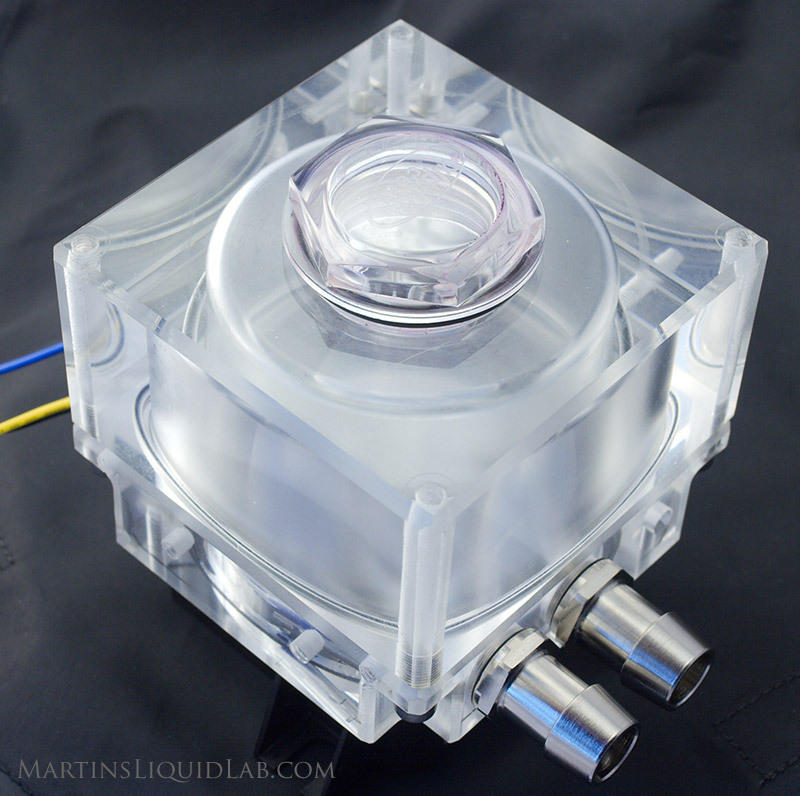 Buy an aftermarket top for your DDC 3.1, and you'll be cooling in style! 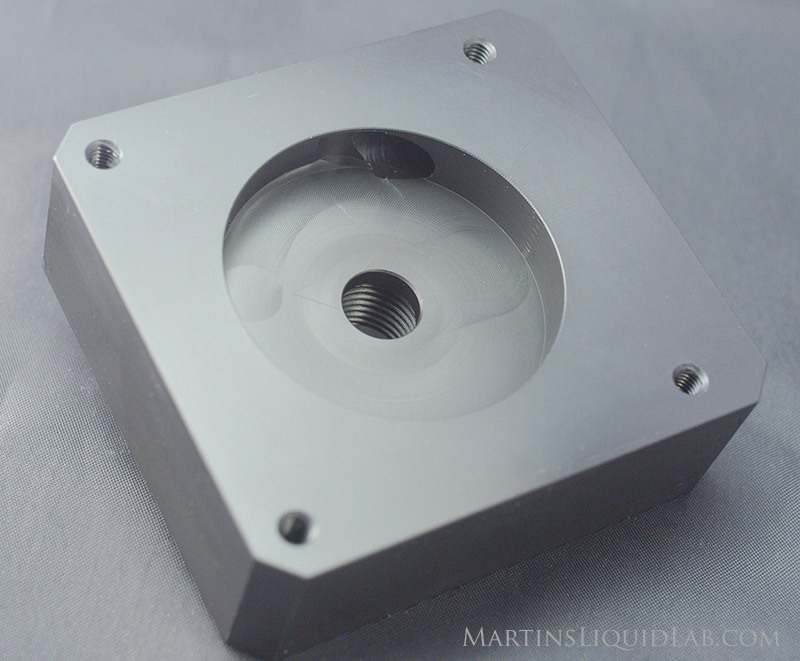 Currently the XSPC reservoir and XSPC regular tops are performing the best with there true spiral volute designs. Hope you enjoyed another pump top shootout....cheers! !